The good news is that D2+D crypto virus doesn’t encrypt any files but it only tries to trick victims into paying the ransom. The security researchers have cracked the D2+D ransomware code and let it out in public. Thus, it seems that when a victim of D2+D virus enters the password 215249148 in the indicated file, the monitor screen would unlock. However, the PC and all data stored on it continue to be at risk as long as D2+D virus files remain on the system. Furthermore, if the threat remains on the computer, it will appear each time the Windows is started due to registry modifications performed during the infection flow. The complete removal of all malicious files and objects created by the D2+D virus is necessary as it will prevent the offensive window displayed by D2+D ransomware virus and protect data theft by crooks. How can D2+D virus infection land on the PC? Cyber criminals may use several attack vectors for ransomware distribution. 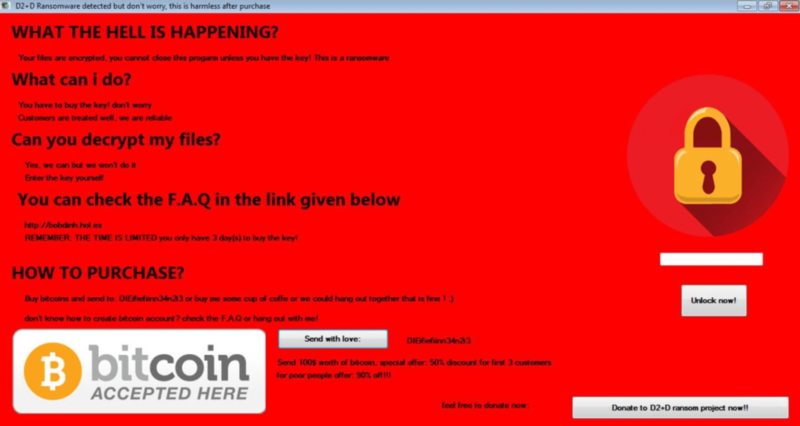 Commonly they choose to spread the malicious D2+D executable files via email campaigns. An attack email usually displays a link that may be embedded in a phrase, built-in a button or hidden in a picture. Now you may be wondering what could be wrong with such a link. Well, it may land you on a page crafted in a way to initiate an automatic download of malicious D2+D virus payloads on the PC. Some email campaigns are designed to mislead you to download and start a file attached to the email. Once you run the malicious file on the computer, it infects it and starts the D2+D infection. Another attack vector may be freeware bundling. This method allows hackers to hide the malicious D2+D payload in the installation setup of a freeware program so when you install it, you unnoticeably install the ransomware too. WARNING! Manual removal of the D2+D ransomware virus requires being familiar with system files and registries. Removing important data accidentally can lead to permanent system damage. If you don’t feel comfortable with manual instructions, download a powerful anti-malware tool that will scan your system for malware and clean it safely for you. WARNING! All files and objects associated with D2+D ransomware virus should be removed from the infected PC before any data recovery attempts. Otherwise the virus may encrypt restored files. Furthermore, a backup of all encrypted files stored on external media is highly recommendable.